Heigham, J. (2011). Self-access evolution: One university’s journey toward learner control. Studies in Self-Access Learning Journal, 2(2), 78-86. This article describes the development of a small self-access center at a university in central Japan. The center grew out of pre-existing language lab and evolved into a student-run center facility that has very little daily teacher or staff control. The paper describes the main stages this low-budget center moved through to bring it to its current status and shares some student views on the value of the center. The purpose of this article is to describe the development of the Sugiyama Jogakuen University (SJU) Self-Access Center (SAC) from required courses in a language lab into the small student-run facility it is today. Although the SAC opened in 2004, the idea for it began in 1998 when I saw my first language learning center, called a media center. The short tour left me deeply impressed. Three years later, I was hired to revitalize the fifteen-year-old curriculum for the freshman English program of the Department of English at SJU. When offered this opportunity, I knew that some kind of language learning center designed to help students take some control over their learning would be a part of whatever I built for the department. From then to now, the journey of SJU to offer its students choices in their learning has moved through four major transformations, each of which I will describe briefly before I detail the current role of student workers in the SJU SAC today. At SJC, self-access learning, if I may call it that, began in 2002 in the university’s traditionally designed language lab. This pre-existing lab, which was tightly packed with individual listening stations – with tape players, was used because we had no alternative. We could not operate it as a self-access center because there were no existing materials, and no funds to buy adequate new resources or to pay teachers or staff. In order to make the best use of the facility, we decided to create a required course to be held there, and to make the course a learner-centered one. I collected a small selection of listening materials from within the department, grouped them by level, and we allowed students to choose what they listened to while in the class. Our 120 freshmen English majors were required to take the course as one of five English courses in their freshman English curriculum. In addition to this in-class listening, they were required to do extensive reading using graded readers from the library. In class, teachers had regular advising sessions which included discussions with students about students’ work for the class, their work in other English classes (the curriculum for which the teachers were familiar with and some of which were also taught by the teachers themselves) and their English learning in general. It was hoped that these small opportunities to make choices about their learning and the one-on-one meetings with their teacher would help them develop greater learner independence. Even if one accepts Benson’s (2001) broad definition of a self-access center as “any purposefully designed facility in which learning resources are made directly available for learners” (p. 114), what we had was not a self-access center; nevertheless, students were intrigued by the notion of making some choices about their learning. Because of the positive response to this new type of course, in 2003 I proposed building a small self-access center. At this time, the university was changing the School of Literature, which housed the Department of English, into the School of Cross-cultural Studies, a School that was to hold two departments: the Department of Foreign Studies (formerly the Department of English) and the Department of Classical and Contemporary Cultures This momentum gave me the opportunity to propose to change the freshman English program into a communicative English program that would extend through students’ third year, and the proposal was accepted. The Communicative English Program (CEP) is a small program and not all students can participate throughout its three years. It is competitive with only students who qualify continuing, and it can serve nearly 300 students out of the 700 first through third-year students within the School. Students are invited to continue in the program based on teacher recommendations and standardized test results (TOEIC). With the advent of the new School, it seemed an appropriate time to make further improvements to our curriculum, so my proposal was approved, and I was given a small budget of 3 million yen (about 30 thousand U.S. dollars) for building costs and equipment, two small rooms to join together and 600,000 yen (about six thousand U.S. dollars) for materials. In the spring of 2004, we moved into our new room. It was about 80 square meters and had 25 individual stations, each of which housed a CD player, a video player or a computer. Additionally, it was a brightly lit, colorfully designed space. The new room was without question, a significant improvement over the language lab. However, there were still no funds to pay staff, so the actual opportunities for the students did not progress much. We continued to have the classes led by teachers, and the center was closed when there was not a class in session because there was no one to oversee the space. Part of the new CEP curriculum changes was the addition of a one-semester learner training course designed to help students develop language learning strategies which was aimed at supporting students’ self-access work. Beyond this, the original self-access class stayed basically the same, but when we opened the new room, we started a required second-year course and began building a small library of books that students could use to study on their own. Because students continued to be receptive to the idea of taking some control over their learning, we started looking for other opportunities for them that did not have any cost. In late 2004, we organized peer-led grammar tutoring and then in 2005 peer-led discussion groups. Because these events could not be held in the center while classes were in session, we used a classroom beside it. As time went on, we discovered that many students were willing to participate in English activities and that they were impressed and motivated by their peers. Additionally, we found some students wanting to become grammar tutors and discussion group leaders. We realized that it was time to give students the opportunities a real self-access center could afford them and that they themselves could run it. Thus, in 2006 I developed a proposal to join an adjacent classroom to our existing center, and, as getting the necessary funds to pay dedicated staff was an impossibility, to create a small ongoing budget that would allow us to pay students to take care of it. The proposal was accepted, and in the second half of 2008, the first real self-access center opened at SJU. The SJU SAC consists of two rooms divided by a glass wall which has large sliding doors that open so the room can operate as one or two rooms. It is designed so students who want to work alone can have a quite space to do so, and students who want to work together do not have to worry about bothering others. The space for individual work is a smaller room, and we refer to it as the Annex. In lieu of a listening course, CEP students are required to visit the Annex 12 times each semester to do independent listening. I should note that students cannot attend the Annex more than once a day or twice a week for class credit to avoid students waiting until the end of the semester to complete their required visits and thus defeat the purpose of the assignment. Freshmen receive guidance about this work and a tour of the center in their learner training class. Beyond this requirement, all other attendance in the center is voluntary. The SAC is a non-Japanese space that has daily discussion groups, frequent events such as workshops or cultural celebrations and a small library of materials for student and teacher use. Since 2009 it has been open 35 hours a week during the school terms and is run entirely by students. The student workers in the SAC roughly consist of six peer advisors (PAs) who are paid to take care of the center, two grammar tutors who are also paid and up to twenty volunteers that work one to three times a week to host discussion groups. (Although the SAC is non-Japanese space, there is one exception. The grammar tutoring, which is held during lunch in the Annex, is offered in Japanese because students that need help with grammar often need it explained in Japanese.) One full-time teacher is in charge of overseeing the general operation of the center, and one Japanese administrative assistant gives us nominal help with paperwork and placing orders for materials. In order to keep the center a place which is run by students for students, neither of these university staff members work in the center itself, unless it is unavoidable due to a PA being absent and a substitute PA not being found. Teachers and guests host periodic events in the center such as workshops on language learning strategies and information sessions about English events in the city, but even at these times, the PAs are still in charge. Although there are a variety of students who work in the center, since the PAs are the most instrumental, I will focus on their work. The PAs are third and fourth-year students; some who were invited to become PAs because of their exemplary dedication to studying English and others who volunteered. As the SAC develops, more students are asking to become PAs. Although not all those who volunteer for the job can become one, we consider this trend to be a positive indication that providing near peer role modeling (Murphey, 1998), helping give students the opportunity to find peers to respect and admire – and emulate, is working. Additionally, in Japan, there is a strong cultural tradition of learning from sempai, those with more experience, and guiding kohai, those with less experience. Sempai/kohai relationships begin in junior high school and continue in one form or another throughout adulthood. Nippoda (2002) explains that as people move through life their roles change, and there is considerable social pressure to adhere to the responsibility of every role one holds. Both near peer role modeling and the sempai/kohai cultural phenomena are exemplified below in two comments written by students when asked why they wanted to become a PA.
First, I like to go to SAC. I have been there many times. SAC is a good place to study English and meet new people. That’s why I went there a lot of times. Second, I want more chances to use English. I stayed in Edinburgh for 6 months. I used English everyday but I don’t have enough time to use English in Japan because there is [sic] few classes which I can speak and listen to English, so I want to be a PA and use English in SAC. Moreover, I respect my seniors who are PAs. I remember the first impression of them. They are amazing! I’ve got a kind of shock. They speak English very well and they give me some advices [sic] as seniors about study abroad, studying English and so on. I would like to do the same things for undergraduates. It could be good for them and me. I want to be a PA because previous PAs were my ideal. They were very kind to me, they looked after me friendly, and their amazing English motivated me to study hard. They inspired me. So, I want to be like them. I was looked after by them, so next, it’s my turn. I want to repay senior PAs by advising juniors as a PA. Also, I want to demonstrate my English skills. I want to show that we can improve our English skills without studying abroad, because I can. I am the evidence. I want juniors to have a big hope that we can do it. For that, I want to be a PA. The PAs receive training from the teacher-in-charge and experienced PAs during spring vacation and at the beginning of the academic year. This training includes explanations of procedures (many of which they already know since they have used the center for at least two years prior to becoming a PA) and then extensive role play of the procedures so that they can become confident using the English necessary to do their job. After the training, they regularly communicate with each other in a notebook kept in the PA desk in the SAC and have lunch together about once a month, and all written communication and meetings are in English. There is only one PA working at any given time, so they never work together; however, they build a team spirit through exchanging ideas and concerns in their notebook and meeting informally face-to-face. They also have lunch with the teacher-in-charge and the administrative assistant several times each semester to share new ideas or concerns. The PAs help the students who visit the center by explaining how to use the equipment and giving basic advice on how to choose appropriate materials for what they want to do, for example, if a student wants to improve her reading, the PAs will direct her to the reading materials and share some of their experience trying to improve their own reading. PAs often share their learning experiences from in the center, in their classes and elsewhere. Because of the PA system, students have the opportunity to talk with more senior students about these things; an opportunity they might not otherwise have. Teachers also get help from the PAs when they host a special event, or if they want information about materials to use for their classes or to recommend to their students. An additional job of the PAs is to support the volunteer discussion leaders. The volunteers, who receive training from the teacher-in-charge before they begin, typically work in pairs to host discussion groups held in afternoons called Chitchat and English Lunch held during lunch time. If the discussion leaders need help with something, the PAs assist them. To keep abreast of happenings in the SAC, the teacher-in-charge regularly reads the shared notebook PAs write in and periodically visits the center, but the PAs shoulder nearly all the day-to-day SAC responsibilities on their own. Cooker (2010) remarks that the most effective way to entice students into a self-access center is to make language learning fun, and as we have grown to understand what our students enjoy, our ability to market the center has grown and attendance has increased. The center is promoted as a place where students can talk with and learn from their peers, and this seems to be attractive to our students. We find that students are typically more interested in relaxing and enjoying conversation in English with their peers than ‘studying’ it. Attendance at our English lunch sessions and student-led discussion groups typically far outnumbers attendance at events held by teachers or guests or attendance in the center at non-event times. Following are comments written by three second-year students when asked why they go to the SAC. I go to the SAC because I can talk with my friends and senior students a lot and gain confidence and improve my speaking skill. I enjoy taking with my friends at English lunch. We can help each other when I can’t speak English well. We are friends, so I can relax. That is why I go to SAC. Now, the best reason of it is I want to get used to speaking and listening English, because I’m going to study abroad…. Last year, I was always tired after English Lunch, because telling my friends what I want to say and listening to my friends’ talk were really difficult for me. However, now I enjoy joining English Lunch, and I like talking in English. Spending time with friends is clearly a dominate theme. We have also observed that the materials most frequently used in the center are types with high entertainment value: 1) reading materials such as magazines and graded readers, and 2) movies and dramas. Unfortunately, we have no reliable way of measuring how many students use the center other than records for the required listening in the Annex, which although it happens in the SAC and the students consider it useful, we feel it is somewhat ancillary since it is required. However, since we are seeing this non-Japanese space become a place where students choose to spend their time and which is rarely empty, we feel that at the very least it is successful in motivating students to want to speak in English. One afternoon as I was leaving the SAC after having talked with a PA, I overheard the following conversation between her and a freshman who had come to the center for the first time and had overheard our conversation. Freshman: Umm. (pause) How old are you? PA: I’m a third-year student. Freshman: Your English is too good. That exchange was important for both the freshman, who was impressed and probably inspired, by a peer, and for the PA, who was given a chance to enjoy a moment of pride. I should also say it was important for me because it reconfirmed that putting students in charge of our SAC was the right choice, and shows me that the journey thus far has been in some ways successful. Certainly there are many things that student workers cannot do that teachers or learning advisors can; for example, students visiting SJU SAC cannot get help making learning plans or developing self-assessment skills. However, at present SJU has no means to bring more qualified human resources to the SAC, and despite the center’s shortcomings, it is a dynamic space that is growing more vital every year as a place where students are taking some control over the development of their English. While it may not provide students with all the tools they might find useful in developing their learner independence, at least it motivates many to want to learn, and wanting to learn is indeed the crucial first step. Juanita Heigham has taught at Sugiyama Jogakuen University in Nagoya, Japan for ten years and is the former director of the Communicative English Program and founder of the SAC there. Her research interests include curriculum design, independent learning and teacher development. Murphey, T. (1998). Motivating with near peer role models. In B. Visgatis (Ed.) 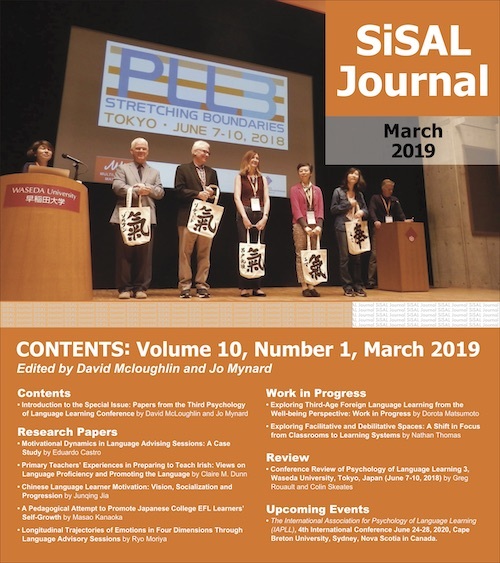 JALT 97 Conference Proceedings: Trends and Transitions, (pp. 205-209). Tokyo: JALT.